Hadrian (Publius Aelius Traianus Hadrianus 76 - 138 AD) was the third of the "five good emperors". Born into a prominent family in Italica, Hispania, he was an able statesman, reformer of laws, a humanist, lover of the arts and a scholar of Greek literature (as a boy he was nicknamed "Graeculus", "Little Greek"). This did not stop him also being a tough-minded general and ruthless suppressor of revolts. He was also a great disciplinarian, imposing a regime of drills, exercises and inspection on his soldiers. He served effectively in Germany and Greece, and his kinsman Emperor Trajan made him governer of Syria. In 117, when the Roman Empire was at its greatest extent, Trajan died and the army proclaimed Hadrian emperor at the age of 41. Having settled many problems at home and abroad, he dedicated the last 18 years of his reign to administrative matters throughout the empire. 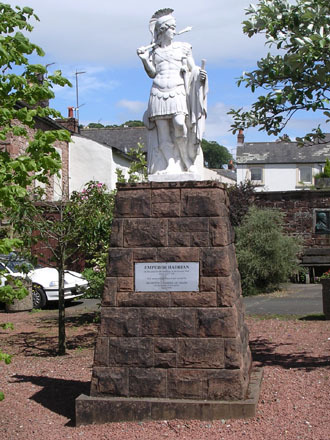 He visited Gaul in 120 and a year or so later travelled on to Britain where he ordered the building of the wall. Construction began in 122 under Aulus Platorius Nepos and took about six years. Stretching between Wallsend-on-Tyne in the east and Bowness-on-Solway in the west, the 5 metre high wall was 80 Roman miles long (117km). Much of the wall was built from turf and wood at first, but eventually the entire length was of sandstone. There were forts which were also crossing points at seven mile intervals, milecastles (small guard posts) every mile, and two observation turrets between milecastles. Deep defensive ditches (the Vallum) were dug along the north and south sides of the wall, except at places where topographical features provided natural defences. Bridges were built at the three locations where the wall crossed rivers. Many of the soldiers who manned the wall were from Belgium, Germany and the Balkans. Civilian settlements grew around the wall, and local farmers and tradesmen supplied the soldiers with some of the necessities of life (though probably not Kendal mint cake or Cumberland sausage, two modern local delicacies). Roman troops kept the local tribes in check over the next 74 years, but in 196 Clodius Albinus removed them to support his attempt to seize the empire. Northern Britain was soon overrun by "barbarians". Emperor Septimius Severus (146-211) arrived in Britain in 208 to restore order, punish the Caledonians and repair the wall. As the empire declined further and further during the 4th century, communication between Britain and Rome became increasingly difficult. Soldiers' pay and supplies stopped arriving, and many of the troops deserted. The frontier eventually became untenable, and the wall was finally abandoned shortly before Magnus Maximus withdrew troops from Britain altogether in 383. With the sack of Rome by Alaric the Goth in 410, it became clear that the Roman soldiers were not going to be coming back. Empreror Honorius told Britons to arrange for their own defence. The local Celtic tribes were left alone to fight off marauding Scots, Picts, Vikings and Saxons until the Normans arrived in the 11th century and attempted to restore order. Over the centuries the stones of the wall have been removed to build farms, houses and churches, most notably nearby Lanercost Priory. A recent surge of public interest in Hadrian's Wall has led to the opening of a number of small visitor centres and museums along its route, including Birdoswald Roman Fort, as well as Hadrian's Wall Path, a footpath which follows the entire length of the wall (opened in 2003).